GIPF is the first game in a series of games from a project of the same name. The games in this series were designed by Kris Burm and the six games in the project were released between 1997 and 2006. The game GIPF was released in 1997 and is a nice x-in-a-row game. I first played it against one of my regular opponents via e-mail. I don’t recall if we used Richard’s PBeM Server or not. In any case, we both enjoyed it and wound up playing it a couple times. I then played quite a bit against GF1 (GIPF for 1) which is a computer implementation. It was a couple years before I got to play it on a board. I normally prefer playing it across the board, but something about GIPFmade it as enjoyable for me to play online. Perhaps it is because that is how I started. I don’t know. The board is a pattern of lines that divide up a hexagon and you play on the intersection of those lines. Essentially, the play area is a standard hex board with four points on a side, making a total of 37 points to play on. In addition, there is another ring around the board that is not part of the play area, but helps you see how pieces are introduced onto the board. More on that soon. In preparing for this review, I went through the rules form start to end. I was mildly surprised to find that there are three versions of the game. I only knew about two of them. I’ll go through all three of them in order, since they build on each other. In the Basic game, each player has 15 pieces. Each player takes three of his pieces and places them in the corners of the outside hex defining the play area such that the colors alternate (see the picture below). This leaves each player with 12 pieces. This is called your reserve. You take turns putting one piece from your reserve onto the board. You do this by placing a piece on one of the dots outside of the play area and then pushes it, onto the play area. If that point is occupied, you push that piece to the next point and repeat. You cannot push a piece off the play area. If you ever form a row of four or more pieces of the same color, the person who is playing that color MUST remove those four pieces and put them into their reserve again, AND they must also remove any pieces that are in a direct extension of these pieces too. If they are opposing pieces, they are removed from the game. If they are friendly pieces, they go back to the reserve. You win when your opponent cannot make another move. It’s important to note that the pieces do not move on their own- to move them, you must push them with a piece from the reserve. I’ve never played this version of the game. One element that I do like about this is that there is a nice handicapping feature built in. The game comes with 18 pieces per side, so you can give the weaker player up to three more pieces with ease. The next time I teach a new player this game, I may indeed start with this version. capture all three of your opponent’s GIPF pieces or capture enough pieces so that your opponent cannot place another piece. This game is nicely balanced and plays in about 45 minutes. The third version of the game is the tournament version. The game is identical to the standard version with the exception of how it starts. Instead of starting with three GIPF pieces on the board, you start with 18 pieces off the board an on your first turn you must introduce a GIPF piece onto the board, just like a standard move. You may continue to introduce GIPF pieces on each of your turns until you place a regular piece. So you COULD spend your first 9 turns playing GIPF piece. Of course, if you do that, then one of those moves better return some pieces to your return or that will be your last play. I prefer the tournament version of the game. This version allows you to pick your strategy. Basically, you get to decide how aggressive you want to be. The more GIPF pieces you have, the more aggressive you can be but, you must be careful because each GIPF piece takes two pieces to make. The tournament version also tends to play just a little faster. The ever changing configuration on the board keeps it interesting too. The board I have is a bi-fold board, but I believe there is a newer printing with a quad-fold board, which I think I would prefer. The pieces are black and white interlocking checker-like pieces. The are a nice plastic with a raised ridge set in slightly from the edge to allow them to stack without toppling. and I started using a paraphrased version of his quote. I now describe the game as Abolone meets Go-Moku. Unfortunately, the comment is lost on people unless they already know about abstract games, so most of the people who might get it already know GIPF already. I give the game GIPF a solid 7 rating. I highly recommend GIPF if you like abstract strategy games. The game does take 45 minutes to an hour, making it one of the longer games in the series. I enjoy myself throughout the game, though. I don’t know that it makes the best introduction into the GIPF series of games, for that I might go with YINSH, instead. The thing about GIPF that really had me fascinated was that it is has a “meta-game” built in. When I mention the GIPF project, that really has multiple meanings. GIPF is the flagship in a series of six games. That series is one meaning of the phrase. The series consists of GIPF, TAMSK, ZERTZ, DVONN, YINSH, and PUNCT. Another meaning is how these games can be combined into a meta-game. The base of this meta-game is GIPF. I’m going to assume you know the rules to GIPF in this review. If you do not, you can read my review of the game GIPF. The GIPF project adds potentials and sub-games. Potentials are additional pieces with the “potential” of a particular move. After you finish putting your GIPF pieces onto the board, you may then start to introduce pieces loaded with potentials. So now you have the basic single piece; you have a GIPF piece, which is two basic pieces stacked on top of each other; and you have pieces loaded with the potentials you choose. You must first play any GIPF pieces you want, then any loaded pieces, then single pieces. Once you introduce a single piece, you may not introduce any other type of piece. A loaded piece is similar to a GIPF piece in that you need not remove it when it is in a line-of-four. The one exception to this is that you cannot leave a line-of-four on the board. So if you make a line of four with only GIPF and loaded pieces, you have to remove at least one of them to break up the line. If a loaded piece is ever removed from the board, the potential is lost. The condition for a player losing the game remain the same, but I find it more intuitive to think of them in a slightly different way. You lose the game if you ever have no GIPF pieces on the board OR if you cannot make a move. Since this game adds moves other than introducing new pieces from your reserve, you will not lose just because your reserve is empty. TAMSK Potential: When a piece loaded with your TAMSK potential gets pushed into the center point, you get another move. You take the potential off the piece and introduce it as a new single piece. This is all one turn, so after the first move of this special turn, you do not remove pieces that form a line of four. This is only done at the end of the turn. Notice that this extra move does not require you to play a piece from your reserve. When the potential is captured, regardless of by whom, it is removed from the game. ZERTZ Potential: The ZERTZ potential allows you to jump instead of placing a piece from your reserve. Unlike the TAMSK potential, this can be done on any turn. You simply make the jump and discard the potential. This jump can be over any number of pieces in a straight line, but it may not jump over an empty point. That is, it must land in the very next empty point and it must jump over at least one piece. As a side-note, this does not capture the pieces jumped. DVONN Potential: The DVONN potential is interesting in that it allows you to jump it onto an opposing basic piece or an opposing piece loaded with a DVONN potential. It cannot jump onto a GIPF piece or any other potential. To use it, you simply move it from your loaded piece to an opposing piece that is adjacent to it. This essentially converts that piece to your color. When that piece would get removed from the board, the underlying piece stays. This has potential to cause some very interesting positions. YINSH and PUNCT: I do not know what the Yinsh and Punct potentials do yet because as of this writing, they haven’t been announced. Now if that wasn’t enough, there is yet another way you can play the potentials- you can combine the various games. To do this, you are playing GIPF with potentials, as stated above, but when you try to use a potential, your opponent can challenge its use. When a potential is challenged, you set aside the GIPF game and play the game that the potential is named for. For example, if you try to use a DVONN potential, your opponent can challenge its use and you play a game of DVONN. If you don’t lose the game, you get to use the potential. If you lose the game, you don’t get to use the potential and you lose the potential. There are a few things you do have to agree on before you start playing. First, how many challenges can you make. I tentatively recommend allowing three of six potentials to be challenged. I want to play this more, but it tends to scare my regular of my opponents. The potentials are slightly modified GIPF pieces. The TAMSK potential has an extra ridge inside the outer ring making it look a little like a target. The DVONN potential is a piece with a hole in the center. The ZERTZ potential has some notches in the ridge. TAMSK Potentials: You can get 3 white and 3 black from the TAMSK game or you can get 6 of each color in GIPF Project Expansion Set #1. ZERTZ & DVONN: You get 6 DVONN potentials in each color and 6 ZERTZ potentials in each color in the GIPF Project Expansion Set #2. I played in one game with DVONN and TAMSK potentials and the TAMSK potentials were huge, but sometimes led to confusion. We were constantly trying to remove pieces between the two moves of the turn. (I say constantly, but I think we only used three of the six TAMSK potentials between us.) The DVONN potentials really didn’t get used much, but they influenced the game tremendously. It almost felt like a completely different game than GIPF with the flavor of GIPF. It almost felt like GIPF with a slight flavor of something else. It’s hard to explain. So far, my opponent and I have played with identical potentials available to us. I’m going to skip out on giving an actual rating to this until I play it more. The potentials add significant complexity to the game and I’m not sure I have a good feel for it yet. And playing a sub-game to earn the right to use a potential is yet another layer. Until you are very familiar with the base game, I would recommend not playing with potentials. Also, I suggest that you introduce only one type of potential at a time. Start with one type, then go from there. The other thing to consider is how many potentials you will be allowed to start with. The recommendation from the publisher is 6 per player. I’ll bow to their experience in this. If you like GIPF and want to try adding a little more complexity to the game, add the potentials. I don’t think that using the potentials makes it a BETTER game, but it certainly does change it up, which is interesting in its own right. In 1998 I read about Shogi and not much later, I played my first game of it. I loved Shogi, but could not find a regular opponent to play against. A month or so later, I read about Chu Shogi in R. Wayne Schmittberger’s book New Rules for Classic Games. I found it intriguing so I made a set of pieces out of some trim and marked the pieces with pen. I made a board out of a piece of canvas and voila, I had a Chu Shogi set. Unfortunately, I still had no opponent. I played against Steve Evan’s Shogi Variants program a few times, but quickly found that it didn’t pose a real challenge to me (especially after I found an opening that caused it to throw away it’s Lion). My homemade board sat in a drawer for quite some time. Eventually, I bought a commercial pieces and thanks to the miracle that is the Internet, I play it online, both in real time and by e-mail. I’m still waiting to find regular across the board opponents, though. Rules: The rules are not difficult for anyone familiar with any Chess-like game. You are moving your pieces in an attempt to CAPTURE your opponent’s King (and Crown Prince, if they have promoted their Drunk Elephant– seriously). However, you do need to learn the movement of a lot of pieces. When playing online or against a computer, you can use “international” pieces, that have the move represented symbolically on the piece, but commercial pieces have the Kanji for the piece name on it. That means that if you don’t read Kanji, there is some memorization required or you’ll need a cheat sheet. If you play Shogi, you already know the Kanji and move for eight of the pieces. 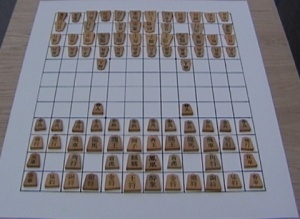 The game is similar to Shogi in how it is played, but it is on a larger scale. While Chess is played on an 8×8 grid and Shogi is played on a 9×9 grid, Chu Shogi is played on a 12×12 grid. Each player has 46 pieces total with 21 different piece types. In Chu Shogi, virtually every piece can promote, but they can only promote to one piece. When a piece reaches the promotion zone (the last four ranks) you can promote the piece by flipping it over to it’s stronger side. If an opposing Lion is two steps away from your Lion, then your Lion can only capture that opposing Lion if that opposing Lion is unprotected- with one exception, see below. If your opponent captures your Lion with a piece other than a Lion, then you may not capture your opponent’s Lion immediately, unless you can do so with a second Lion. Instead, you must wait at least one turn, after which, you may capture your opponent’s Lion freely (subject to all the other rules). Pshew, you made it through! Good job. That is the only rule that is a little scary. It’s not even quite complete, but it’s more than enough for this review. So you can see that the Lion is really quite a powerful piece and the rules preventing them from being traded makes them the focus of the game. Game Play: This and the other larger cousins of Shogi are the “War Games” of Abstracts. They generally take a long time to set up and a long time to play. They are big and have a lot of maneuvering of your armies. Chu Shogi is no exception. With a timer, I struggle to keep my games to 2 hours for each player. It’s a very strategic game, with several opportunities for tactical skirmishes that occur primarily in the middle and end of the game. As to how unforgiving the game is to one bad play, it’s fairly forgiving in the beginning simply because even the best players of the game still make “blunders” of varying degree quite often. This is simply because there is often too much going on and, later in the game, you start to worry about time. When played without a timer, there are fewer blunders, but they still occur. Blunders aside, whoever makes the most efficient use of their moves when positioning their army will usually get to choose the first theater. In the beginning of the game, you need to maneuver your forces to where you want them positioned, maybe sending in a small attack to try to gain a little material or throw off your opponents game. Although the Lion is the strongest piece on the board, the Lion doesnt see a lot of action in the beginning. It generally sits in front of your pawns exerting a LOT of influence in that region. Very passive aggressive ;). Once your pieces are positioned, you engage your opponent. The goal in the mid-game is to gain a little material, and make a path to get your Lion into your opponents territory. As I mentioned, in the mid-game, you will sometimes try to get your Lion into your opponents territory, while trying to create a “moat” so your opponent cannot get their Lion into your territory. This idea of creating a moat deserves its own strategy article. But basically, it’s creating a zone where your opponent cannot simply jump into your territory, but must go through this region that is completely protected. So when you are trying to break through your opponent’s moat, you need to have several minor pieces to pave the way. In this whole process, you are trying to get ahead on “ranged” movers. That is pieces that can move across the board in a single move, like Bishops and Rooks in chess. Another respectable goal in the mid-game is to promote some of the mid-level pieces into power pieces. In the end game, you are trying to use your superiority in force (either in a particular theater or overall) to break up your opponents army to expose his king and CAPTURE it. “Check” and “checkmate” have no meaning in Chu Shogi. You do not need to move to save your King. This is important because it’s possible to have two royal pieces by promoting your Drunk Elephant and if you get the second royal piece, you can sacrifice one, if needed. I have yet to see a Crown Prince except when playing against the computer, but I have gotten close, and my opponent had to spend a lot of time maneuvering away from my King to deal with the Drunk Elephant. If you don’t have the superior force in the end game, you need to send in the forces you can muster to try to gain a local superiority that you can take advantage of before your opponent can get reinforcements on defense. Comments: I love this game. The Lion capture rule takes some special attention, but I can live with it because of the depth of the strategy and tactics you get in the game from the Lion. Components: Like Chess and Checkers, you can buy sets of varying quality. Unlike Chess and Checkers, you’re unlikely to find a Chu Shogi set at your FLGS. There are very nice wooden pieces and boards available from Japan. Unfortunately, I can’t afford to import one of them. However, I did purchase a set of wood grained plastic pieces from George Hodges. There were a few nibs that required some filing, but overall, the quality was good and they feel nice. I did not purchase the vinyl board, but made my own board. Rating: I rate this game a 10/10. I love this game (have I said that?). As far as I’m concerned it has everything except for the player base and popularity that it deserves. It’s a game of pure skill where two players engage in single combat. When I play it, my sense of gestalt is satisfied. It seems complete to me. It has a decent handicap system, even if it’s still not fully understood, so I can play against my non-Chess playing opponents and still have an interesting game. Recommendation: If you read the review, it’s not hard to guess my recommendation. I’ll put in a little caveat, though. If you like abstract strategy games that are deep AND wide, you’ll probably like this game. If you don’t like abstract strategy games, you should stay away from this. It’s big, has lots of pieces (though not as many as Tai Shogi) and takes a lot of maneuvering of your armies. If you like that, this is THE game for you.